Allpest offers family friendly pest management solutions with rapid response times at affordable pricing. Allpest has a dedicated commercial division to deliver premium service for the specific needs of your business and industry. Allpest offer fumigation services to all your imported and exported goods in order to comply with all quarantine requirements. 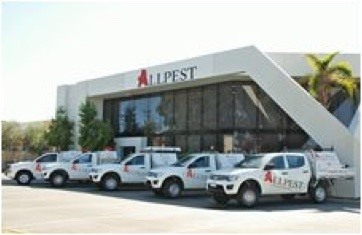 Allpest has a specialised division that provides termite treatments to new homes, commercial properties and renovations. We also provide Fumigation and consultancy services to Perth, the Northwest and around the World. Allpest strives to be the number one choice for pest control in Perth. We aspire to create sustainable business outcomes and achieve industry-leading practices by protecting the health, safety and environment of our employees, clients and the communities in which we operate. Promoting outstanding service and a continuous improvement culture, we recognise that our employees are the foundation of our success. Sustainability - putting health and safety first, being environmentally responsible and supporting our communities. Reliability – we strive to produce high quality outcomes that are timely, accurate, useful, clear and candid. Innovation – we are continually looking for new ways to do things and instil a continuous improvement mindset in our employees. High performance - achieving superior business results by utilising our full capabilities. We provide the highest standard of pest management services across Perth, the North West and for international neighbours, compliant to Australian standards. We value our clients, that’s why we do everything in our power to safeguard your home and business from pests. We offer general domestic pest control for ants, cockroaches, spiders and rodents etc. We also offer organic residential pest control options – a non-toxic way to get rid of pests. Our treatments come with a warranty. Part of our unique service is that we provide onsite quotes, and we respond to urgent call outs, with a two-hour turnaround time. We provide a reliable and professional commercial pest control service to a wide range of Perth businesses. All our pest management programmes are HACCP, Foodsafe and AQIS compliant. We have a portfolio of over 2000 commercial clients across a variety of industries. Some of our clients include Aged Care and Health Care, establishing our service as highly accredited and qualified. When it comes to pest control, cockroaches are one of the most common pests that need to be exterminated in households and businesses. We will professionally eradicate your property of all species of cockroaches, large and small, in an efficient and safe manner. Also referred to as ‘white ants’, termites can cause extensive damage. When you have a termite infestation don’t delay in calling in the experts to minimise the damage and fight back. Termites are responsible for causing millions of dollars damage across Australia annually. We use a variety of termite control chemical treatments but also operate Exterra, one of the world best termite defence solutions. We are also open to using more environmentally friendly systems whenever possible. Like termites, rats require rapid treatment when there’s an infestation as rats pose a major health risk to homes and businesses, spreading disease, contaminating food, and chewing wiring. Our rat control techniques are safe and effective. Our pest exterminator services extend into the mining industry where we are committed to the environmental management and quarantine of Barrow Island, implementing pest control programmes as specified by Chevron. Our pre-construction division is where our expert technicians make use of multiple termite management systems to protect your construction builds. Many of these systems will protect your building long after construction has been completed. We are licensed and experienced to carry out our fumigation service according to your needs. Our services comply with all relevant AQIS standards. For further information, contact us about our pest management services.